Children’s names are usually the first written words that they learn. From a very early age, they may be able to recognize their first letter and will often announce, “Look! There’s my E!” We can support children’s literacy development by using their interest in this most important word as a springboard for other letter learning. 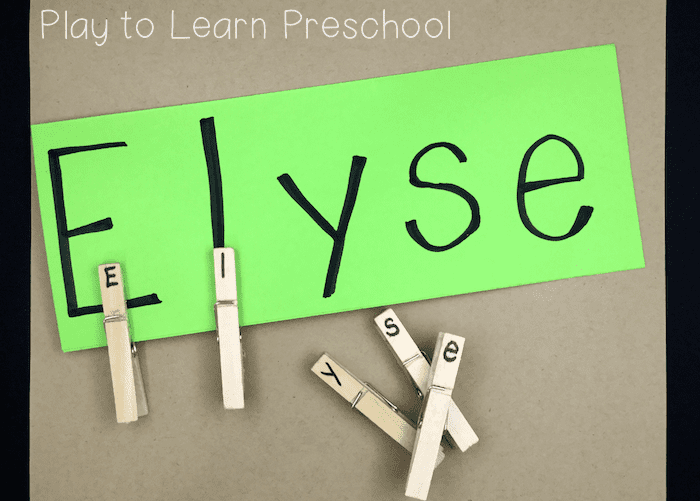 Most children are ready to learn to spell their names from about the ages 3-4. 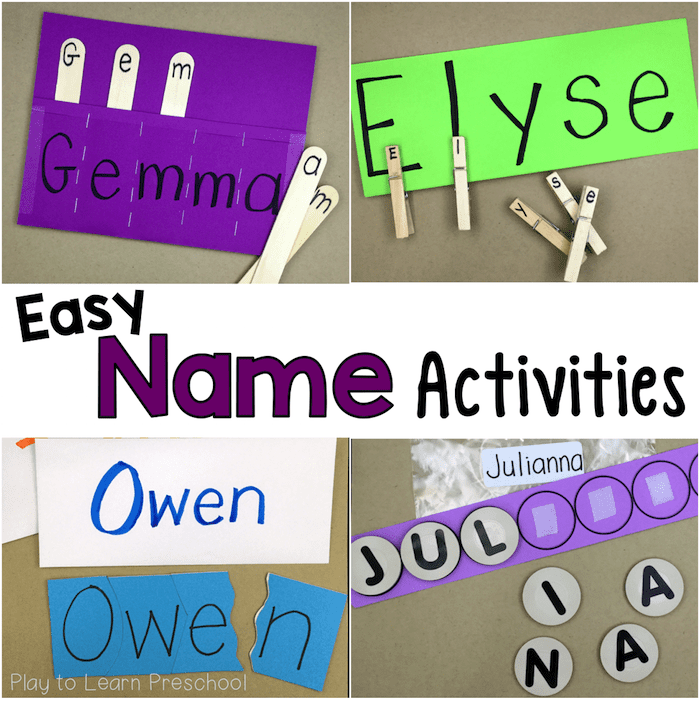 Use these simple, homemade name activities as an arrival activity when your preschoolers first come to school or set them up for practice at the literacy center. Make a new set each month and send them home at the end of the month for extra practice. 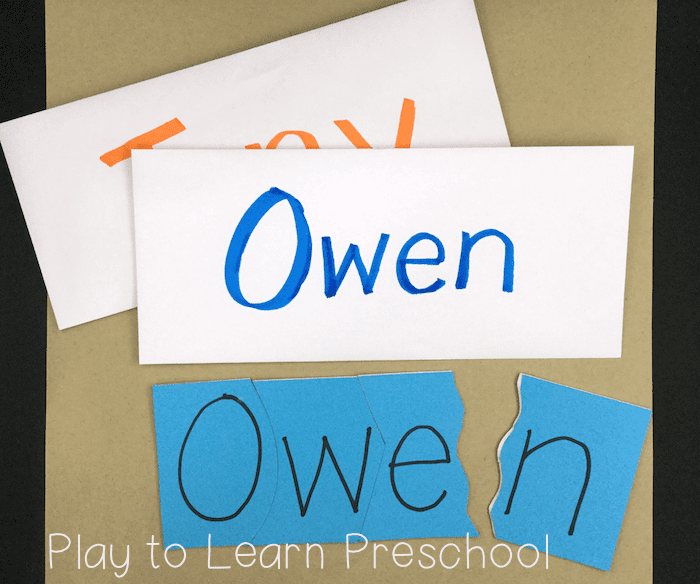 Write the child’s name on a sentence strip or spell it with letter stickers. 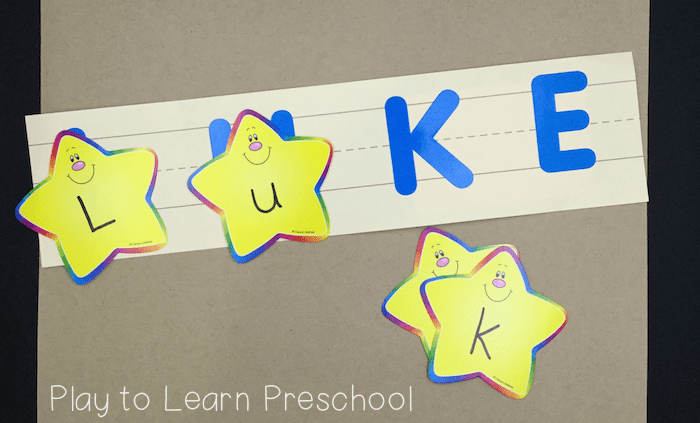 Program die cut pieces (like these stars) with the letters of the child’s name. Children who are learning to match upper and lower case letters will benefit from matching one to the other. Attach a small envelope on the back of the sentence strip to store the pieces when not in use. 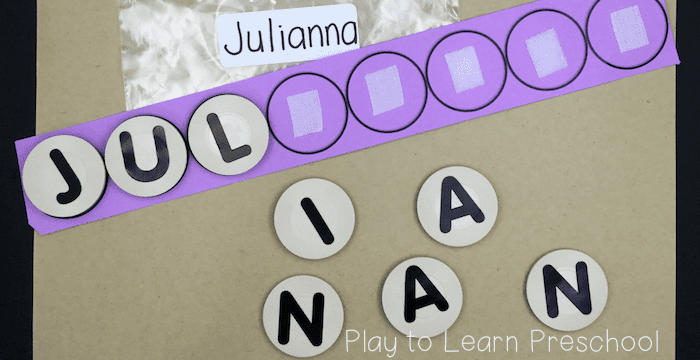 Make each child his/her own name puzzle using adhesive craft foam. 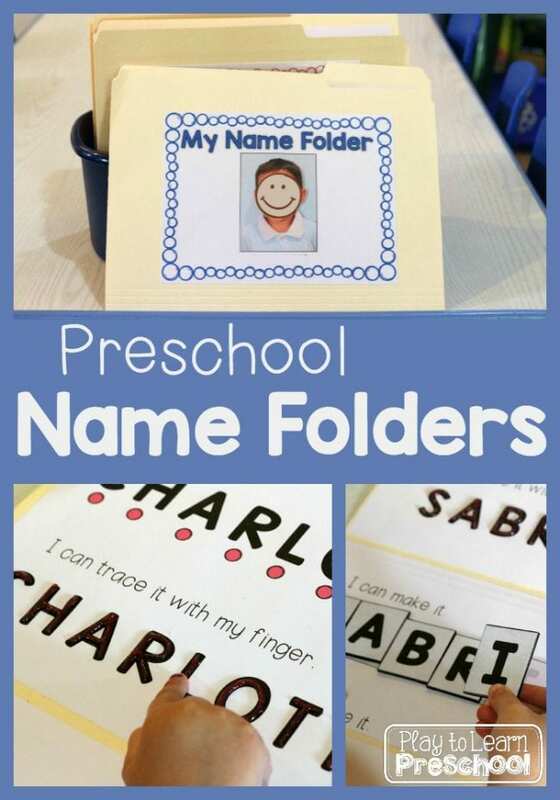 Simply attach a piece of cardstock to the foam, then write the child’s name on it. Cut the letters apart in varying patterns. Store pieces in a labeled envelope. Fold a piece of cardstock in half. Use a long-armed stapler to section off the correct number of pockets. 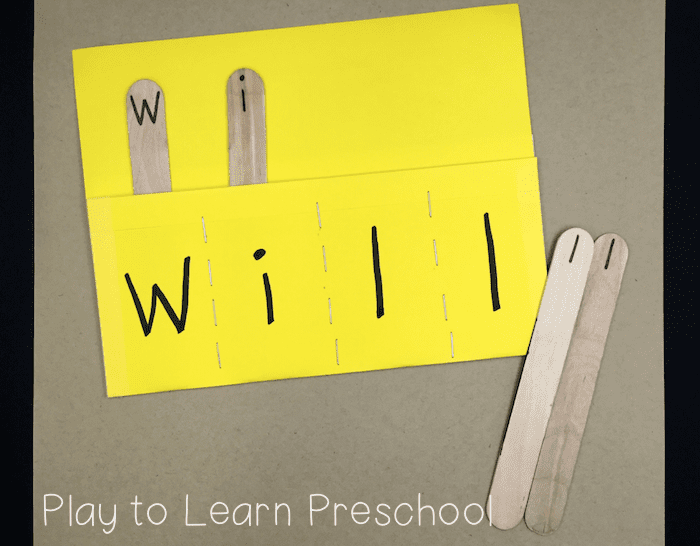 Write the letters of the child’s name on the pockets and also craft sticks. We like to put uppercase letters on one side of the stick and lower case on the other, to help them make a connection between the two. Program poker chips, bingo chips, or other round counters with the letters of each child’s name. You can write them with a permanent marker or use letter stickers like we did. Trace the chips onto a narrow piece of cardstock. Add velcro pieces to each chip. Students attach the letters of their name in order to spell it correctly. Store the chips in a baggie labeled with the child’s name. Program a set of cubes with the letters of each child’s name. 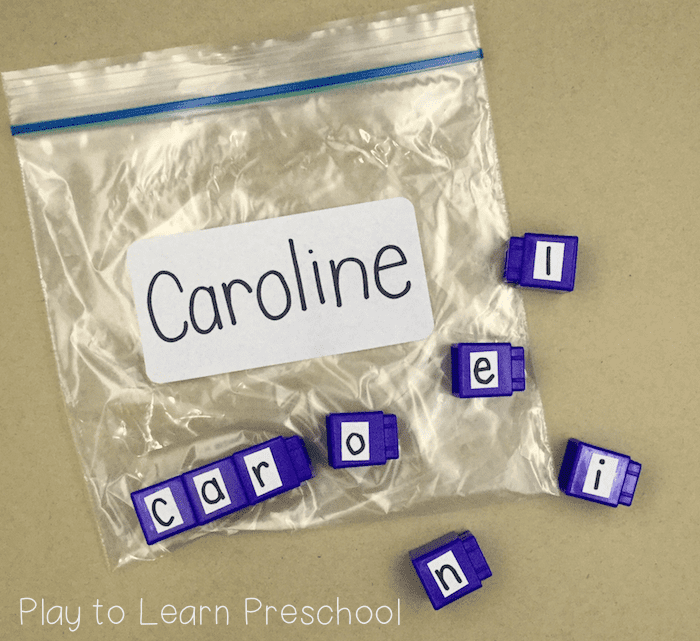 Store the cubes in a baggie labeled with the child’s name. Children connect the cubes to spell their name. Type each child’s name into this easy form, and the name books will print with 1 letter and a matching picture on each page. Cut the pages apart, and either staple them together or glue them into a little cardstock book. 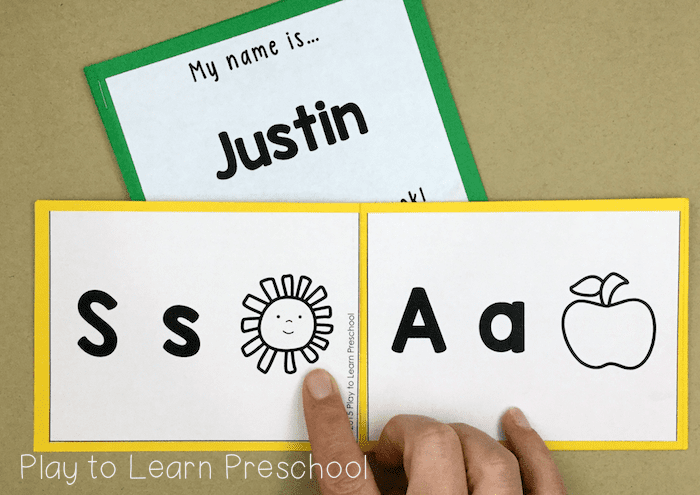 Write each child’s name on a piece of cardstock. Children use their fine motor skills to clip each clclothespin letter onto the matching written letter. Awesome ideas thanks for Sharing! Perfect for learn the own name. Love these ideas. Simple yet effective.